The festivities of Indian culture, the climax of love, the debut of knowledge, the dedication of devotion to the god of learning and music is celebrated in the spring. On the same day, Goddess Saraswati ji had a glimpse of the world to eliminate the monotony and to communicate knowledge and music in all the beings. Therefore, Mother Saraswati is specially worshiped as Saraswati Puja in educational and cultural institutions on this day. Goddess is prayed that they should remove the darkness of ignorance and provide light of knowledge. When and why Basant Panchami is celebrated? The Fifth day of the Shukla Paksha ( bright half) of Hindu Lumi-solar calendar month of Magh. Generally, it falls in January or February. In 2019 Basant Panchami falls on 10th February. It is believed that the Saraswati, goddess of wisdom, wisdom, and knowledge was born on this day. 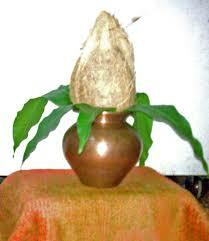 Hence this day is also known as Wagishwari Jayanti and Shri Panchami. In the 10/125 Sukta of Rig Veda, the infinite influence and glory of Saraswati Devi has been described. Basant Panchami day is considered very auspicious in the mythological texts of the Hindus. Therefore, Foundation stone-laying, Worshiping, Home warming ceremony, Vehicle purchase, Commencement of new business and Starting a new work are started after worshiping Goddess Saraswati. People wear yellow clothes on this day, as well as make a yellow dish. 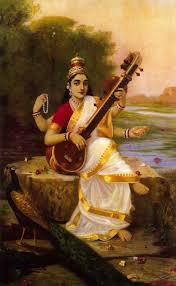 Goddess Saraswati is the supreme of knowledge, skills, singing and playing wisdom. On this day, the students must worship their books along with the Guru (master) and cast with their instruments. 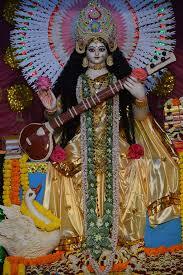 It is believed that Goddess Saraswati is the inventor of Sanskrit language and gifted pen and book to Lord Ganesha. 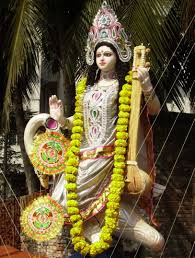 So Saraswati puja is a traditional culture in India and Hindus across the world. On the day of Basant Panchami, parents consider it auspicious for the beginning of the education of their children. This is the simple mantra to pronounce. As the goddess of Goddess Bhagwati Saraswati ji, the flower of the moon, the snow, and the pearl's necklace is white, and who wear white clothes, in whose hands the harp is shining, who have taken the asanas on white lotus And Brahma Vishnu and Shankar, who are forever worshiped by Gods, Saraswati Ji, who gave away the entire inertia and ignorance, protect us. Shukla Varna, full of whole past life, Adyashakti, the essence of contemplation and contemplation about Parabrahma, embodiment of ultimate prosperity, giving happiness to all the fears, eradicating the darkness of ignorance, harp in the hands, book and I can praise Lord of the Goddess of the Rhinestone and decorate with the highest Aishwarya, Goddess Bhagwati Sharda (Saraswati Devi), who provides intellectual wisdom on Padmasana.